(PhysOrg.com) -- Among the many applications of flexible thermoelectric materials is a wristwatch powered by the temperature difference between the human body and the surrounding environment. But if you wanted this watch made of low-cost carbon nanotube (CNT)/polymer materials, you would currently need a piece of fabric with an area of about 500 cm2, which is about 50 times greater than the area of a typical wristwatch. In order to make such applications more practical, a team of researchers has developed a new multi-layer CNT/polymer design and demonstrated that it has a greatly increased power output compared to previous designs. The new CNT/polymer, which the researchers call “Power Felt,” also has the potential to be much less expensive than other thermoelectric materials. The research team, which includes Ph.D. student Corey Hewitt and Professor David Carroll from Wake Forest University, along with collaborators from other institutions, has published a paper on the new thermoelectric fabric design in a recent issue of Nano Letters. Although thermoelectrics have been studied and used commercially for several decades, they’re traditionally made of inorganic materials, such as bismuth telluride (Bi2Te3). But recent research has shown that organic materials could provide a promising alternative, with advantages such as low cost, ease of production, and flexibility. Yet for now, organic materials still lag behind inorganic ones in terms of performance. One of the keys for designing a high-performance thermoelectric fabric is creating a large temperature difference on opposite sides of the material. Since CNT/polymer thermoelectric materials are very thin, the temperature difference perpendicular to the film’s surface is limited. To address this problem, the researchers here designed a multi-layer CNT/polymer film that allows for the arrangement of the temperature gradient parallel to the film’s surface. The film consists of up to hundreds of alternating layers of conducting material (a polymer containing CNTs) and insulating material (pure polymer) bonded together. Each layer has a thickness of just 25-40 µm. When the fabric is subject to a temperature difference parallel to the surface, electrons or holes travel from the hot side to the cold side due to the Seebeck effect, which converts temperature difference into voltage. As the researchers explain, the amount of generated voltage (and total power output) is equal to the sum of contributions from each layer. So adding layers to the fabric is equivalent to adding voltage sources in series, and the number of layers is limited only by the heat source’s ability to produce a sufficient change in temperature throughout all the layers. 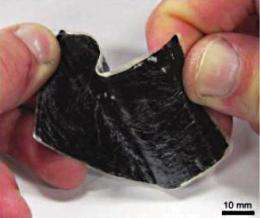 Here, the heat source’s temperature is limited to 390 K (117 °C, 242 °F), the point at which the polymer begins deforming. Experiments on a 72-layer fabric demonstrated a maximum power generation of 137 nW at a temperature difference of 50 K. But the researchers predict that the power output can be increased; for example, they calculate that a 300-layer fabric exposed to a 100 K temperature difference has a theoretical power output of up to 5 µW. From another perspective, the wristwatch mentioned above would require much less fabric than the current requirement of 500 cm2. In terms of cost, if CNT/polymer thermoelectrics are produced on a large scale, the electricity they generate could cost as little as $1 per watt due to the low material cost and ease of production. In contrast, Bi2Te3 thermoelectrics currently generate electricity at a cost of about $7 per watt. As Carroll explained, the true test of the materials will be cost. The researchers predict that low-cost organic thermoelectric fabrics could have a multitude of applications. Besides the wristwatch, another wearable application could be winter jackets with thermoelectric inside liners that use the temperature difference between body heat and the outdoor temperature to power electronic devices, such as an iPod. Other potential applications include recapturing a car’s wasted heat energy in order to improve fuel mileage, and lining a vehicle’s seats with the fabric to provide electricity for the vehicle’s battery. If installed under roof shingles, the fabric could generate electricity on hot days to help lower a building’s electricity bills. And in emergencies, the fabric could potentially be used to power a cell phone or flashlight. In the future, the researchers plan to further improve the power output of each film, using methods such as chemical treatment of the CNTs and increasing the electrical conductivity of the polymers. "Besides the wristwatch, another wearable application could be winter jackets with thermoelectric inside liners that use the temperature difference between body heat and the outdoor temperature to power electronic devices, such as an iPod." What a goofy idea. One puts on a winter jacket to keep warm not to transfer heat to the atmosphere. The human body generates about 120 watts of power. An Ipod uses about 2 (total guess). Lets say that the fabric is 10% efficient which would be a very high number. Thus 20 watts or 1/5 of your body heat would be sacrificed to run a stupid entertainment device. I still don't understand why the inventors are pushing using body heat when there are so many sources of waste heat available that can be utilized. Lastly, 50 degrees K (90 degrees F) is a huge temperature difference and the body could not endure that for long. It would be the equivalent of soaking in ice water. Our body is going to radiate heat anyway, specially in the infrared spectrum, which is lost with or without jackets. Why not recovering some of it ?, I think it is a good idea. If you read the article carefully and look at the wattage produced you will see that the inventors do not have the slightest idea how to use this invention. Hummmmm, we will generate power by putting it under roof shingles. Great idea except for two minor details. You would have to use some sort of insulated nails to attach the shingles to the roof and the plywood roof does not really conduct heat all that well. Thus you could not maintain the required heat gradient. If they really thought that this product was anything other than a laboratory curiosity they would be concentrating on reclaiming wasted industrial heat and not piddling around in the lunatic fringe of the green consumer market. The greater the temperature difference, the greater the power output. In the article they're talking about a difference of 100 Kelvin. The difference between a human and the air surrounding us (indoors) varies between approximately 10K and 17K. That's miniscule and will generate little power. This material and others like it have incredible potential... but almost all of it is industrial in the short term (like power plants). And even in the medium term, heat to electricity conversion tech would be silly to use on a relatively low energy density object like a human. It would be much easier and more economical to apply it to things like CPUs, GPUs, and high end (very hot) batteries to reduce energy loss. At the relatively low energy gained I'd first look at the additional weight this stuff brings with it. It might not be worth it. A few microwatts of power isn't going to go anywhere in extending the range of an electric car. As with most basic materials research, the end products may look nothing like the applications originally imagined by the researchers. That in no way minimizes the value of the original research. Many useful and economical everyday products evolved from ideas that some deemed pointless or inadequate at their inception. I suspect there are plenty of other researchers investigating ways to harvest industrial waste heat--it's a big resource and thus will attract plenty of money. That does not mean that every researcher should focus on it. We need the "lunatic fringe" researchers too, who often point the way to big outcomes from seemingly uneconomical investigations. Furthermore, the rate of consumption of power by billions of little gadgets will only increase, so why not look at ways to offset the generation required? I realize that this is just the first stage of a long research journey for this product but as things stand now it takes more energy to create the product than it will generate in it's useful life time. Nmtucson, don't get me wrong here I am all for basic research and the scientists that do it. You are correct, that is how all new breakthroughs are discovered and I think our only hope to keep from going back to the 1800s. The researches are not lunatics. I was just remarking that the uses that they suggested for the discovery would only appeal to the lunatic fringe of green users. Don't dismiss generating power on a human so quickly, as it would be a major convenience if electronics carried around does not need recharging at a power point. And the technology does lend itself to small scale use, so residential uses could well be justifiable. At the suggested price of 1$ per watt it would pay for itself in a few years. Solar cells on a beanie would work also. Perhaps that is an overlooked market. If I wrap this stuff around my 40 gal hot water heater, how much electricity would I get in return in one day? My guess is less than 5 watts or about 1/10KWH. Very true. I have an automatic kinetically powered watch that's over ten years old. The watch uses a clockwork mechanism, which means it requires more energy than a solid state electronic watch might, and yet the power generated through kinetic energy is more than enough to keep it going, now well over ten years. So I do agree, that personal scavenging tech can be very useful and should be developed further. This "power felt" steals small amounts of heat from a hot object as that heat flows from hot to warm. The more heat that is removed from hot object, the greater the energy production. So it would probably create a fair bit of energy from your hot water heater... if you have an old, inefficient hot water heater. But if you do, you'll save far more money buying a new efficient heater than you would wrapping your old one in this felt. In the case of a water heater this device would turn it into a very, very inefficient gas generator (you'd burn a lot of gas for little electricity). Has great potential on space suit on sunny side of Mars.